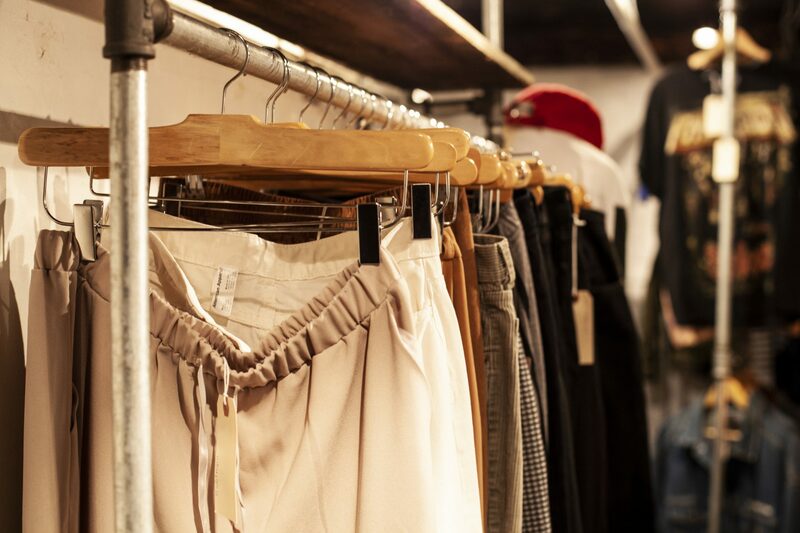 Thrifting and vintage shopping have turned into a rising trend in a time where sustainable fashion and the ethics surrounding it are becoming more valued in terms of how and where we shop. Fast fashion dominates a large portion of clothing sales, which multiple large corporations have been revealed to make in order to produce their products at massive rates. Cheap, low-quality accessories and clothing items that are made by the hands of workers who are paid below minimum-wage, in factories with questionable work environments, are the consequence of the fast fashion shopping world we live in. The environment also takes a hit when clothes are produced at such high rates in such large quantities. These short-lived purchases are inevitably thrown away within a year or less because their mediocre quality can’t withstand longterm wear, with these items ending up in landfills as a result. This is where thrifting provides a positive alternative to these questionable clothing practices. Whether you’re new to finding thrift store wear or you’re an esteemed secondhand shopper, the key to finding what you want for the most reasonable price is going to the right stores to do it. Thrift shopping is often associated with chain stores like Value Village and Talize. Although these places offer affordable options and some unique finds, they aren’t the only choic-es you can go to and they aren’t necessarily the best if you’re looking for more to buy than your yearly Halloween costume. Secondhand does not mean second best, and it’s apparent with stores like White Tiger Vintage Boutique that you aren’t sacrificing style or quality for a thrifty purchase. White Tiger Vintage Boutique, located on King St. East, is a modest-sized store that operates to the beat of its own drum — marked by its distinct black and white signage out front and eye-catching window displays that alternate depending on seasonal fashion trends. Walking inside feels like stepping into a treasured and lovingly organized time capsule, and it’s clear that the store is a work of labour and care to the products they sell. With busy walls, eclectic decor and a homey setting, White Tiger’s atmosphere is reminiscent of an inviting 1970s living room, its vibe effortlessly cool and relaxed. White Tiger’s style savvy owner, Miranda Campbell, opened the store back in 2011, having been an avid vintage shopper herself in high school. “I just really loved vintage clothing, I had a lot of clothes saved up over time from thrifting, so I had a collection. I just had an idea that I wanted to open up a shop like this,” Campbell said. All of the stock you see in her store has been carefully chosen and has arrived from a variety of places in and out of the country. “I travel quite a bit, so I’ll go to thrift stores along the way. I was just in Montreal last weekend, so I picked up a lot of stuff there and I went to the States in the summer. I like to travel around to get stuff, but I will look around locally and people will bring stuff in for me,” Campbell said. Unlike other thrift stores, White Tiger has a selection of clothes that are specifically picked out and cared for before they’re on sale. “I wash and I clean all of our clothes and we do a lot of repairs. We put a lot into just putting it onto the floor. Coming in here, it’s more selected than going into a thrift shop, because you have to sort through a lot of stuff,” Campbell said. “All of this denim and all of this leather is just made so much better than clothes now, so it actual-ly lasts a lot longer,” she said. The quality is immediately clear just by looking at the clothes, accessories and shoes they have in store. Stacks of Levi jeans look close to brand new and racks of fall-coloured leather coats appear barely worn. “Fashion always repeats itself. Every single year, there’s always another era that becomes more strong,” Campbell said.